Retrieving HARK sound localization and separation information using Ros and Python. HARK Is A Program Which Allows Advanced Signal Processing Like Sound Source Localization, Separation, And Acoustic Feature Extraction. This Tutorial Will Focus On Sound Separation And How To Retrieve Such Information Using ROS And Python. It Will Also Demonstrate How This Information Could Be Useful For robotics by moving Turtlesim to the direction of located sound sources. HARK sound separation network file. RosNodeGenerator: Generates a master node. Main_Loop: Appears after you create iterator sheet. Now that we have everything that we need, let’s begin by testing our network file. Please extract and move your network file, audio files, transfer function which are located in a single folder named Hark_Tutorials to any desired destination. Now we will test our Network file. Then, in another terminal, execute the test network file. A pop-up window will appear named Source Location. Once a sound source is located it will be posted on the Source Location screen. In this example using the 0_degree.wav file we found that a sound source was located at 0 degrees. A new web-browser window will appear. Please click on File. Select Hark_Tutorial.n, click on load next to the x. Please note that executing the network file in the GUI will not work. This is due to the fact that in the constant node, we have specified ARG1, which allows us to choose an input file using a Terminal. If you wish to execute the network file using the GUI please copy all the files contained in the Hark_Tutorials folder to /usr/lib/hark-designer/userdata/networks, double click on the constant node, change the value from subnet_param to string, and change the name from ARG1 to 0_degree.wav. Now hit execute. We have successfully tested our Network file. Now, let’s find out what nodes are in charge of receiving information sent by HARK. Let’s begin by moving to our Hark_Tutorials directory and initiating our network file. Now let’s run rostopic list to see all available topics. As you can see we have a topic named /HarkSource. Let’s see what type of message this node is receiving. As you can see in the hark_msgs/HarkSource message. hark_msgs/HarkSourceVal is a list, consisting of located source information. From this we know that we can extract source id, x, y, z, azimuth and elevation using hark_msgs/HarkSource message. There are other messages that will be published in the hark_msgs/HarkSource message. Like std_msgs/Header, seq, and time stamp. In this tutorial we will demonstrate how to receive all the contents inside of hark_msgs/HarkSourceVal . But for this tutorial we will only utilize azimuth. Now let’s use the 0_degree.wav file. Not just HarkSourceVal. Once ./Hark_Tutorial.n 0_degrees.wav has finished executing, go back to the “rostopic echo” terminal and scroll the output up until you see the following. Once HARK has found a source, it will publish all the information of the detected sources, in our case at azimuth -4.992 degrees. In this segment we learned that the /HarkSource topic receives a hark_msgs/HarkSource message. This message contains information about the sound source localized by HARK like elevation and azimuth. Now let’s continue the tutorial by learning how to control Turtlesim. In two new Terminals lets launch Turtlesim(Turtle Simulator) and turtle_teleop which allows us to control Turtlesim with our keyboard. Since we already ran roscore, your environment should look similar to this. Click on turtle_teleop_key terminal and move the Turtlesim with your arrow keys. Now, let’s run rostopic list to see the current available rostopics. Here we can see that teleop is indeed publishing to the /turtle1/cmd_vel using geometry_msgs/Twist ros message. Let’s see what geometry_msgs/Twist is composed of by running rosmsg show in the same terminal. Now let’s see how exactly this message is being used by checking what is being published to the /turtle1/cmd_vel topic. Let’s begin by clicking on the turtle_teleop_key Terminal and pressing the forward key. We can see that by pressing the forward key the teleop publishes Linear x: 2.0 to the /turtle1/cmd_vel topic. In this segment we learned how to control the Turtlesim and, what message is used to do so. Let’s take everything we learned from the previous two segments and combine them. Let’s begin by opening HarkRosTutorial with your text editor. From the previous segments we learned which messages are used to control Turtlesim and what messages are used to receive source information from HARK. We will begin by importing Ros python, HarkSource message, and Twist message. rospy.init_node initializes our node named Hark_Tutorial. rospy.Subscriber will subscribe to /HarkSource topic, and will receive HarkSource messages. rospy.spin() keeps python from exiting until Hark_Tutorial node is stopped. Now we will receive all the messages published to /HarkSource topic. The messages received in the callback can be accessed in the msg.src list. Like we saw in the HARK-ROS-MSG section, 0_degree.wav file gave an azimuth of -4.9. We will use different azimuth ranges for each direction. If the azimuth falls in a certain range we will move the Turtlesim accordingly. publish(lin_speed, ang_speed) sets lin_speed and ang_speed according to the azimuth range. rospy.publisher() will publish geometry_msgs/Twist messages to the /turtle1/cmd_vel topic. move_cmd.linear.x and move_cmd.angular.z choose the direction and speed, like we saw in the Turtlesim Control segment. Finally, cmd_vel.publish(move_cmd) publishes the message. Let’s test our script. Please close all terminals used so far and open three new terminals.We will run Turtlesim, our python script, and our network file separately. Finally all we need to do now, is run our network file. There are 4 source .wav files. We will use 180_degree.wav file for our next test. 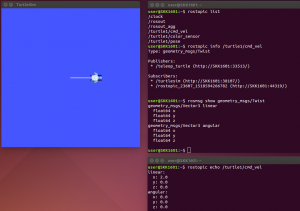 When executing the next command, our Turtlesim should move backwards. If everything went well you should see something like this. You could now test the other source .wav files to move the Turtlesim as you wish. In this case we used HARK source localization to manipulate Turtlesim. We look forward to see you you implement HARK in your projects. If you would like to have source localization in real time, you can use AudioSteamFromMic instead of AudioSteamFromWave. In this section we will demonstrate how turtlesim can move a place sound source by using HARK – ROS – MESSAGES. Spawn_max_val_x, Spawn_max_val_y Are The Maximum And Minimum Values Of Spawn Source Turtle. FindSource Class:. Receives Hark-Ros-Messages And Extracts The Azimuth This Tells Us The Direction Of The Located Sound Source. It will relay this information to the SpawnSource class and call the Move function. Move function: Every time FindSource received a HARK message it will tell the Move function to move the turtle forward. When this program is initialized it will reset our turtlesim. While also initializing FindSource class. tutorial, the new turtles representing the sound sources are always spawned at the same distance from the center turtle. Let us begin by stopping any previous process (if you executed the previous tutorials) and then run roscore and turtlesim in separate terminals. Let Us Run Now Our Program. Please Move To The Hark_Tutorials Folder Destination And Run Move_Towards_Source.Py. Now in another terminal run. As you can see our turtle will move towards the located sound. In this case HARK located a sound source at 180 degrees. This demonstrates how turtlesim will move towards a located sound source represented by a spawned turtle. It also helps visualize our azimuth value extracted from HARK-ROS-MESSAGES. Hark-Ros and Turtlesim Realistic Example. In this section we will demonstrate a more realistic scenario. Instead of resetting the turtlesim position at every new sound source, the turtlesim will move towards any located sound sources located by HARK from its last position. max_val_x, max_val_y are the maximum and minimum values of x and y in our turtlesim window. SpawnSource class: Spawns a turtle that represents the direction of the sound source input to HARK. It will also delete any previously spawned turtles. FindSource Class: Receives Hark-Ros-Messages and extracts the azimuth. This tells us the direction of the located sound source. It will relay this information to the SpawnSource class and call the Move_Turtle object methods to move the turtlesim towards the direction of the sound source. Move_Turtle class: We will calculate the angle in which the turtle should face. Once it is near the sound source it will begin to slow down. Again it is important to note that Hark does not estimate the distance of located sound sources. For the purposes of this tutorial, we gave designated distances to our located sound sources represented by a newly spawned turtle. When this program is initialized it will reset our turtlesim, spawn a new turtle and initialize the FindSource class. Please move to the Hark_Tutorials folder destination and run Move_Towards_Source_Realistic.py. The turtlesim should move forward towards the located sound source at 0 degrees. In the same terminal let’s run our network file with 90_degree.wav. HARK has detected a source at 90 degrees. The turtlesim will turn and move towards the located sound source. Finally let’s try – 90_degree.wav file. Hark-Ros-Messages, extract its information, and use it to guide turtlesim towards located sound sources.